Resemblance between actors and actresses is not new, and being talk of the town ever since! Characters in Movies remakes can bring more life with these look a-likes, but are they talented enough to bring life back, its a Question! Sonu Sood, made his bollywood debut from the movie Shaheed-E-Azam as Bhagat Singh in 2002. Would you like to see Sonu Sood doing AB in coming project? Chitrangda Singh started her acting career from Movie Hazaaron Khwaishein Aisi. She is being acknowledged in B town with numerous films under her belt. Isn’t She look a-like of famous Smita Patel ( Raj bubar’s ex Wife). Do You remember Smita from film “Sharabi” against Amitabh Bachan. The actress look alike her mother Sharmila Tagore. She has sharp looks like Sharmila and is fitness enthusiast. Ssumier S Pasricha popularly known as ‘Pammi Aunty’, an Indian actor and comedian has Shocking resemblance to non other than King Khan. After being endlessly compared to actress Reena Roy, seems like Sonakshi Sinha has another look-alike, a woman named Priya Mukerjee. 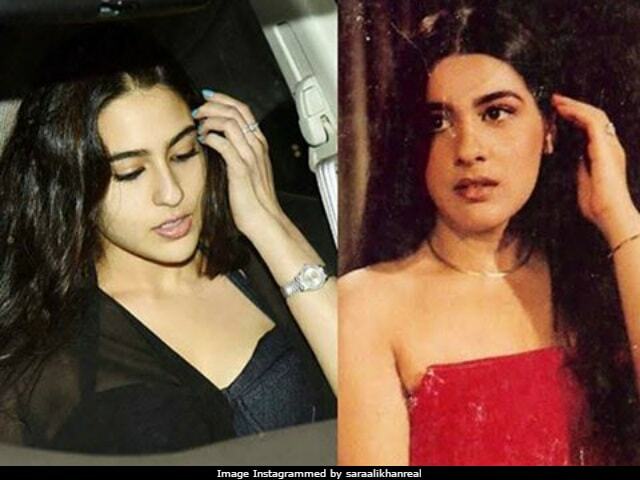 Amrita Singh’s daughter Sara Ali Khan look a-loke her famous mother Amrita Singh. Sara is going to come on big screen this Year, We wish her best of luck. The resemblance between this mother daughter duo is amazing.